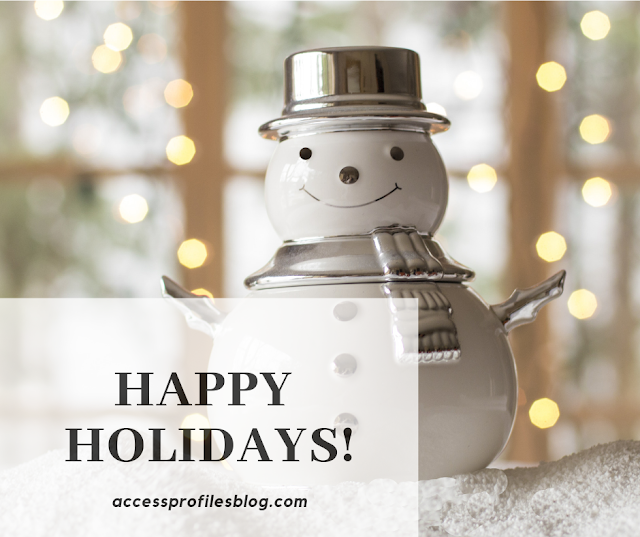 Wishing You the most Wonderful Holiday Season! Let it be filled with family, friends, and joy! 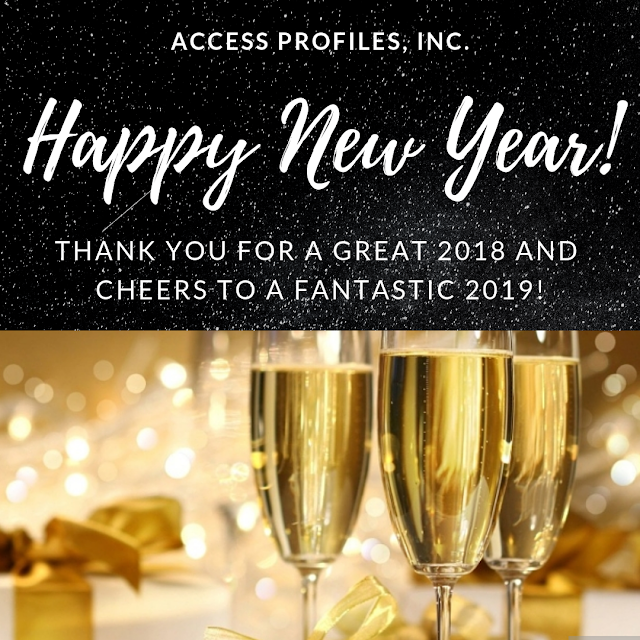 Here at Access Profiles we will be taking the next few weeks to refresh, renew, and recharge. We will be soaking up all the wonders of the season ~ both the quiet times and the chaotic times that, to us, mean "holiday"! Our wish is that you will be able to celebrate in your own unique and thoughtful way too. After the break, we look forward to bringing you more articles focused on you and your small business. Thank you for joining us on our journey. We appreciate you! Thinking of Hiring in the New Year? Contact Us to find out how API can help! Learn more about our Background Investigation, Business Mentoring, and Security Consulting services too! Knowing as much as you can about the person you hire into your company simply makes good business sense. Understanding the skills they bring to the table, whether they are honest, and if they have a criminal record that could jeopardize your company, are all good reasons to screen before you hire. 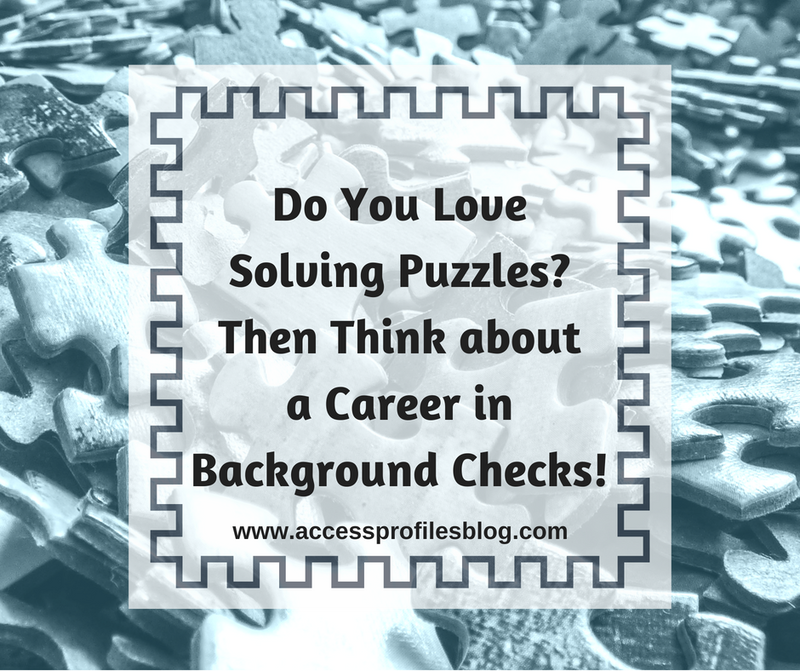 Discover more about the reasons a background check is so important to your hiring process here! 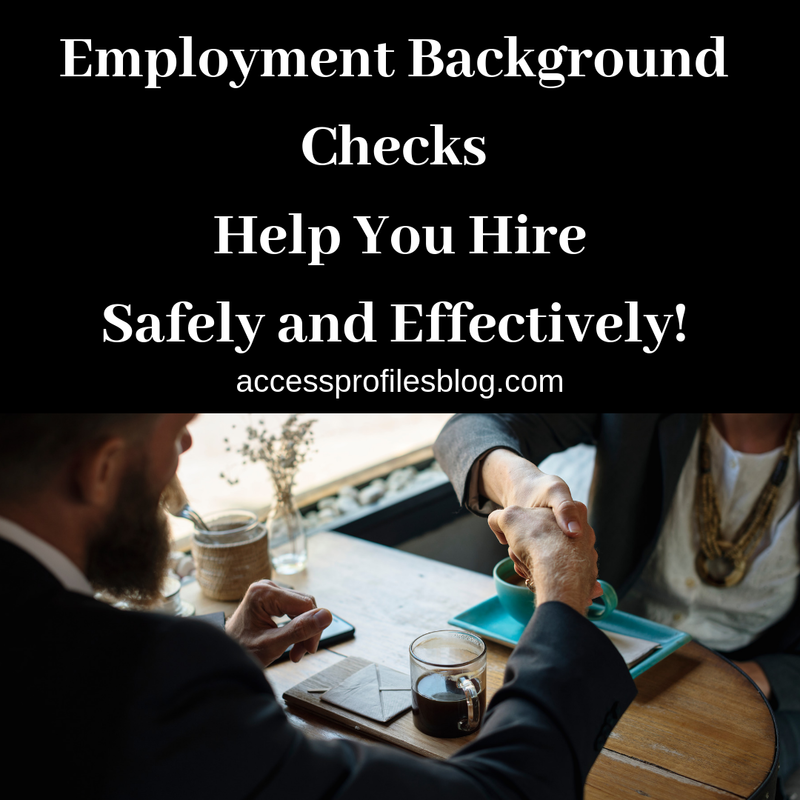 Once you understand the importance of using employment background checks, you need to determine whether you will screen applicants in-house or outsource them to a screening firm. Doing them internally may seem like the way to go, but there are good reasons to hire an outside firm to do your background checks. 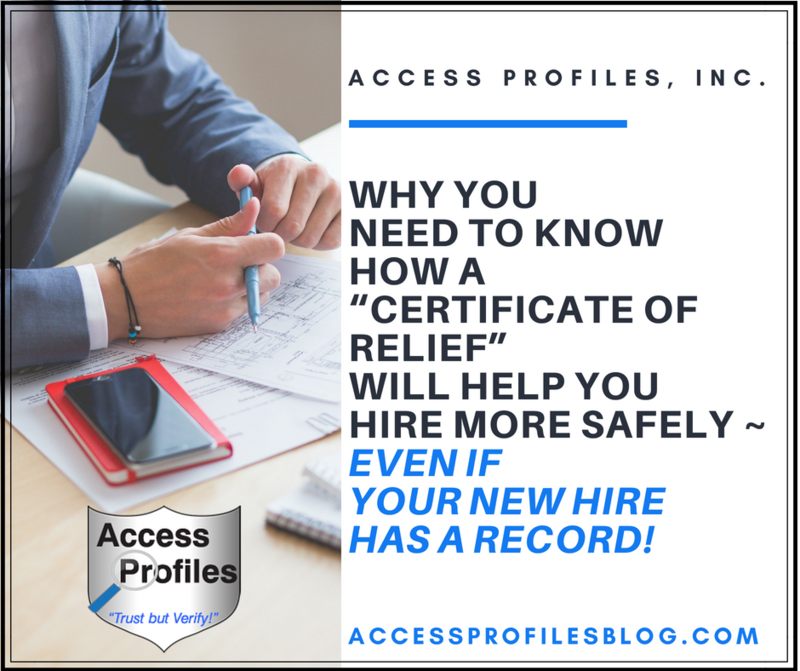 Not only are good screening companies more up-to-date with with the rules and regulations governing background checks, but they can also insulate you from discovering things about your applicant that are problematic when it comes to hiring. Examples of this type of information are an applicant’s race, religion, sexual orientation, and other things that are are considered to be covered under the heading of “protected” classes. When choosing your screening company, it is important to find one that will work WITH you, not just FOR you! A good background check company will take your needs and your budget into consideration. They will also use the best possible sources to obtain their information and take the time necessary to do the job right! 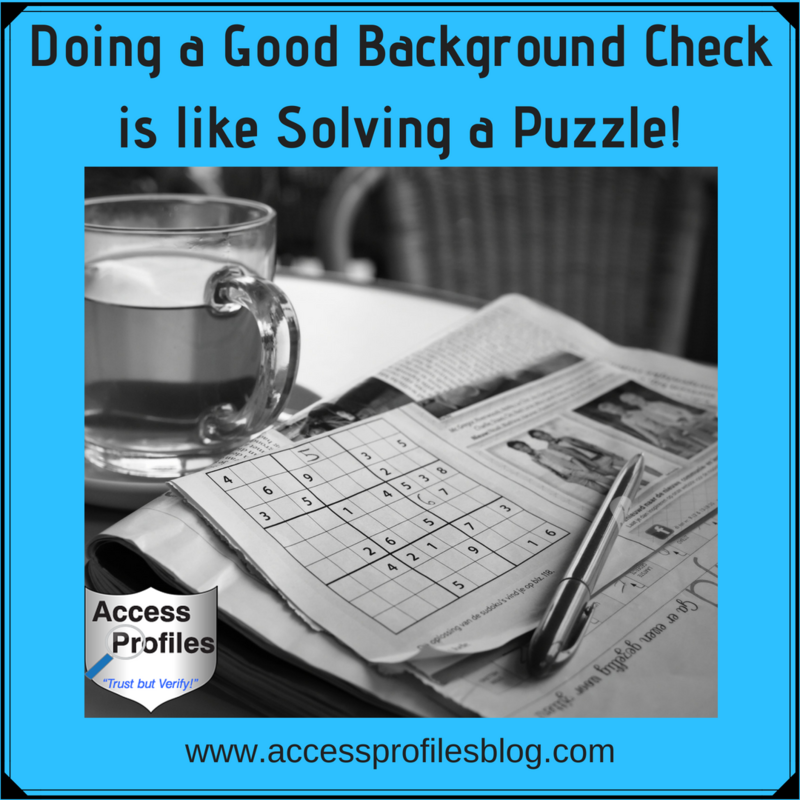 Find out more about choosing a good background check company in “5 Tips to Help You Choose the Best Background Check Company for You”. It is also important that you are compliant in using the information found in your background check report. While your background check company will be invaluable in keeping you on the right track, it is also best for you to be informed. 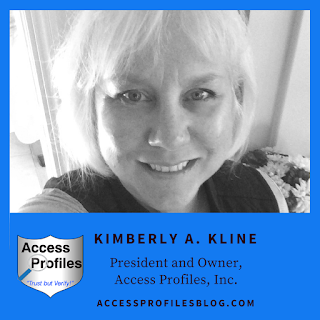 The keys to compliance are understanding the legal guidelines that govern employment background checks and that your applicant has very definite rights when it comes to the screening process. One of the most important of these guidelines is understanding what to do if your applicant has a criminal record that may keep them from getting hired. There are specific steps you must follow and questions you must ask before you make your final hiring decision. Learn more about these steps in “You have your Background Check Report ~ Now What?”. 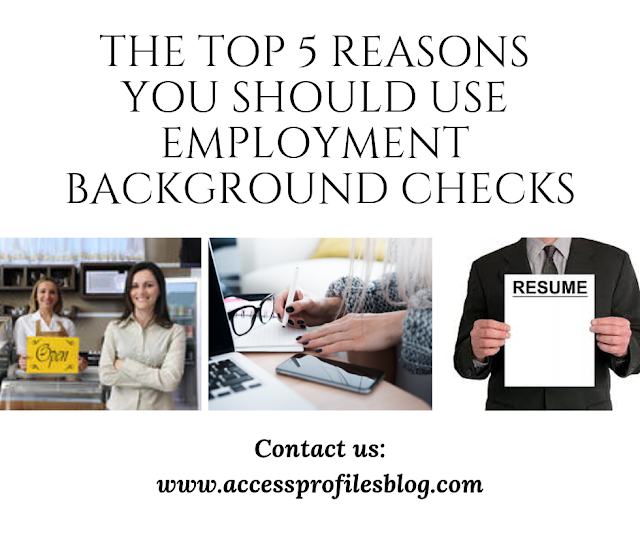 Employment Background Checks are a valuable tool that should be utilized in any company. 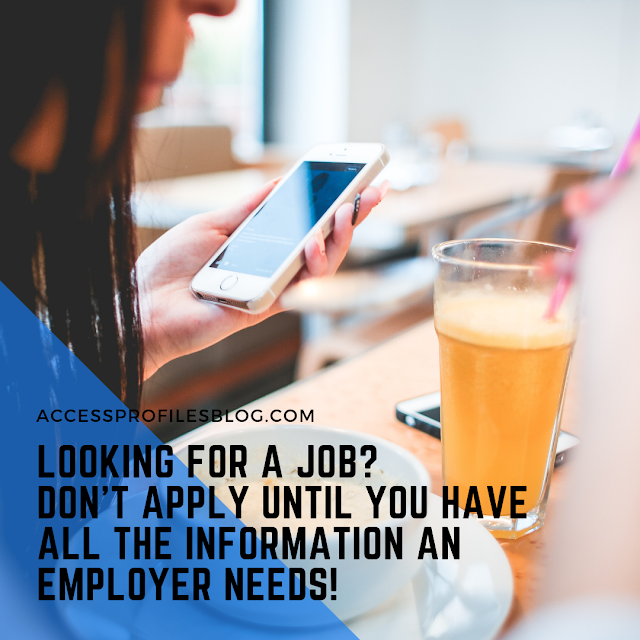 They will help you go into the hiring process fully prepared and ensure that your final employment decision is made with your eyes wide open. Is Your Company Ready to Hire Right? Get Started Now! Contact Us! API will answer your Employment Background Check Questions and help you make the best hiring decisions. Why High Schools & Parents Need to Start Preparing Teens Now for the “Real World”! Is Your Teen Ready for the "Real World"? 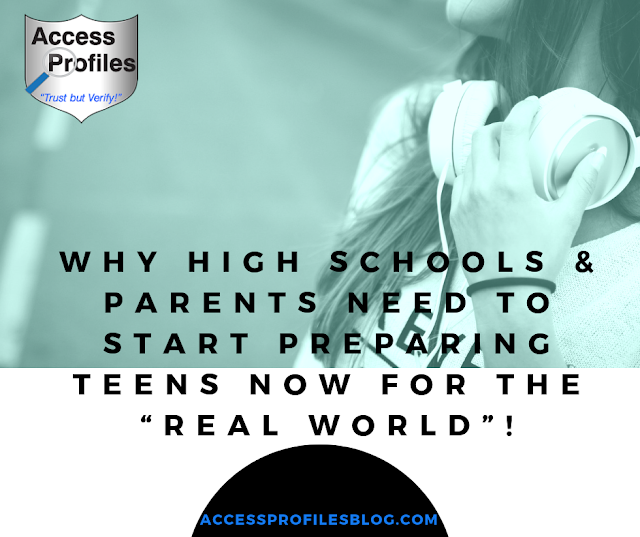 Is Your Teen really ready for the “Real World”? Most likely your answer to this question will range anywhere from “I think so”, or “I’m not sure”, to “No Way”! The reality is that many young people aren’t really prepared for the “adult” world. They know very little of what it is like to have a job or what it takes to live completely on their own. That is why the time is now for Parents and High Schools to step up! More attention needs to be paid to teaching our teens the skills needed by employers and the skills needed that will help them succeed in life. And this is what we all can do to help….. When it comes to hiring young employees, companies are looking for a variety of things. Of course they want new hires to have at least the intro-level skills necessary to do the job. But many are willing to hire those a little less qualified if they have the important “basic” skills that they truly covet in a good employee. These skills are really more like character traits. They include things like having a good attitude and a strong motivation to do a good job. Employers also desire an employee that is on time and comes in ready to focus on work. Many employers find new young hires unprepared in these areas, and that is where schools and parents can help. When it comes to education, most high schools focus on preparing their students for college, or at least some type of further education or training. This makes sense when the goal is to put them on a path to getting into a good school and then landing a good job. But there is little or no emphasis on the other skills they need to succeed once they are on that path. And practically no time at all is spent discussing what young people need to do and how they need to behave when they get a job. 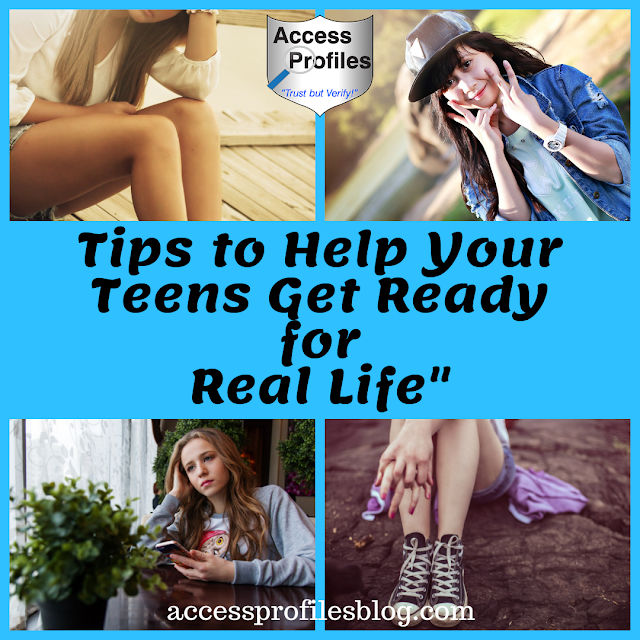 Tips to Help Teens Get Ready for “Real Life”! However, the burden to teach these skills cannot fall solely on our schools. Parents need to do their part. Long before it comes time for your teens to get a job or get ready for college or trade schools, parents, need to be realistic and straightforward with their teens. Teach them “life skills” like how to open and manage a checking account, how to do their taxes, and even how to read a basic contract. Talk about finances and the need for a budget. Explain about a pay check and the many withdrawals taken for things like taxes, insurance, and even a 401k. Then show them how to create a household budget based on their take-home pay. Focus on the necessities like mortgage or rent payments, taxes, utilities, car payments, gas, and food. Then show them how to live on what’s left! Many parents are reluctant to talk about money with their kids. It is a topic often dismissed as one that our kids shouldn’t have to deal with “just yet” or one that makes some parents uneasy. But being upfront about money is perhaps one of the most important conversations you can have. If you, for whatever reason, don’t want to share your real salary or household budget, don’t let that stop you from discussing finances. Use a hypothetical salary, or even when your teen gets their first a job, use their salary. Then help them set a budget of their own. The goal is not to allow your uneasiness in talking about money stop the conversation from happening. It is also important to talk with your kids about about social media. They need to recognize the potential ramifications of what they post on their future college acceptance and job search. Act as an example of responsible online behavior and don’t shy away from monitoring theirs. Also share with your teen what it is really like in the workplace. Focus on what employers expect and what they look for in a new hire. Use yourself and your own work experiences as an example. Do this long before they are even thinking about getting that first job. Be sure they understand that approaching each and every job they ever have with dedication, enthusiasm, and a good work ethic is key. 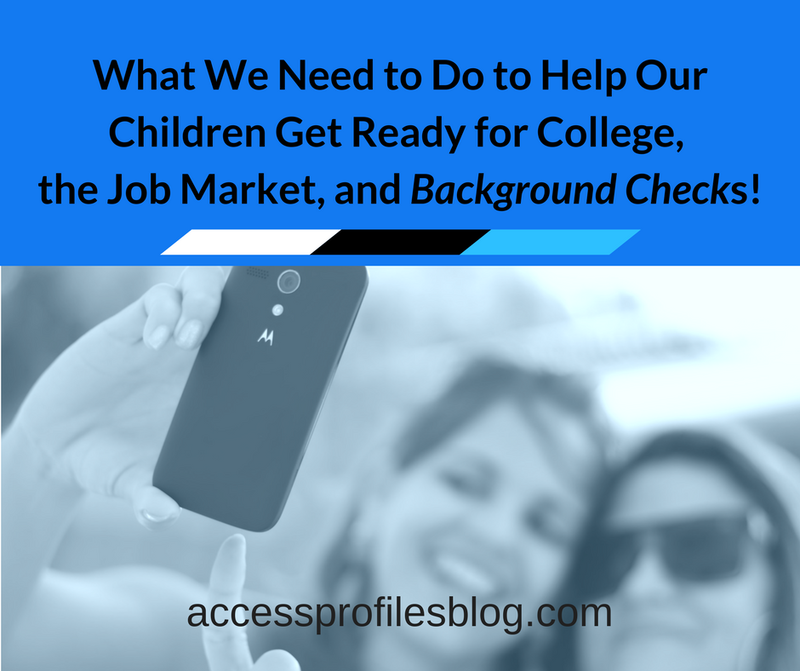 Then continue by making sure they also understand that their future college acceptance and job search will most likely include a background check ~ and what they do now can have an impact! “The first, and most important, thing to realize is that Background Checks are a Reality! This preparation needs to begin early ~ long before our children are even thinking about picking a school or getting a job or apartment. And the key to this preparation is knowing exactly what will be checked, why it is checked, and what can be found during your background check”. 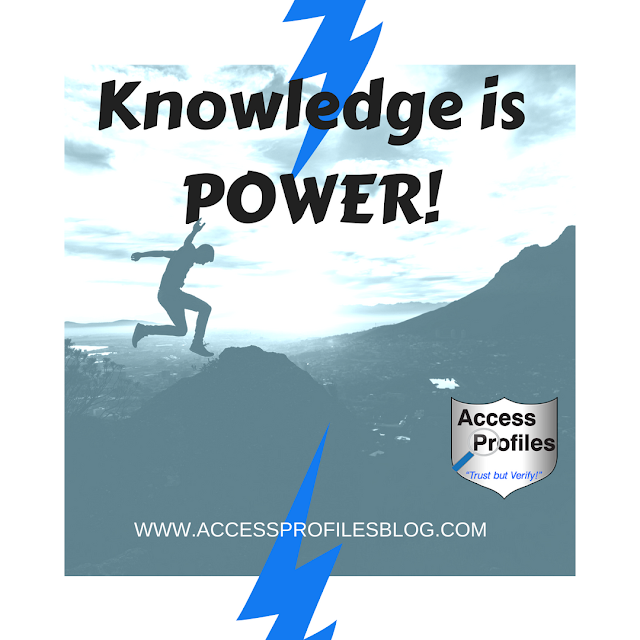 Find out more about preparing your teens for their job search in “What We Need to Do to Help Our Children Get Ready for College, the Job Market, and Background Checks”. Even after your teens have graduated, whether it be from high school, a trade or tech school, or college, it is important they understand what it will take to stand out and land their first job. In “Attention New Grads! What You need to Do to Land Your First Job!”, you will find 10 tips to help your new grad get hired. 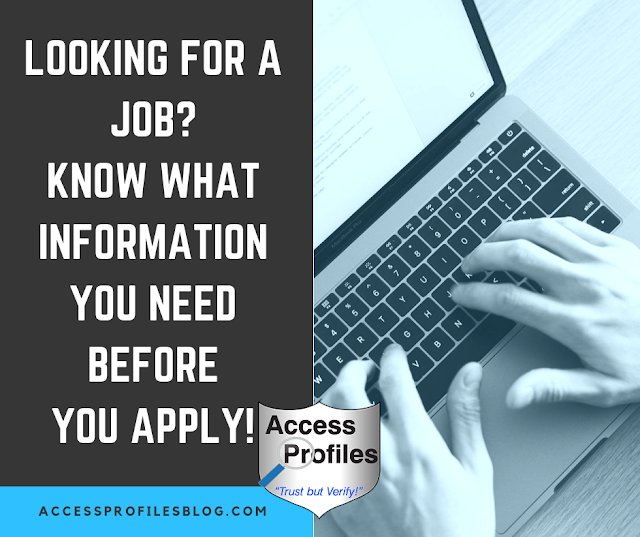 These tips cover everything from making sure their resume is “background check ready”, cleaning up their social media, to the importance of networking and focusing their job search. We all want our children to succeed in life. We want them to be happy, healthy, secure, and productive. And it is our duty to make sure they have the skills and knowledge to achieve these goals. Doing what we can now both in our schools and in our homes to prepare them simply makes sense. Are your kids ready? Contact Us and learn about our Background Investigation and Job Search services here. You can also find out more About Us and our Business Mentoring and Security Consulting services too! Can a Hacker Erase my Criminal Records? This question was recently posted on a popular Q & A site and, honestly, the question itself had me curious. What was the the person who posted this really trying to accomplish? Did they actually think that “hacking” into a database and trying to wipe their criminal past clean was a viable option? Of course, the answer to that is no….and any reasonable person would understand this. But then the question becomes, what is this person really asking, and why? After thinking about it a bit, I believe it comes down to this, those with a criminal history are often desperate. They are looking for any way to get beyond the stigma of their past. And this is especially true when they are trying to change and better themselves. Many with a criminal record find that moving forward and trying to get out of a dangerous neighborhood or find a job is often difficult and frustrating. I understand and empathize with this. So that is what I had in mind when I sat down to share my answer…. 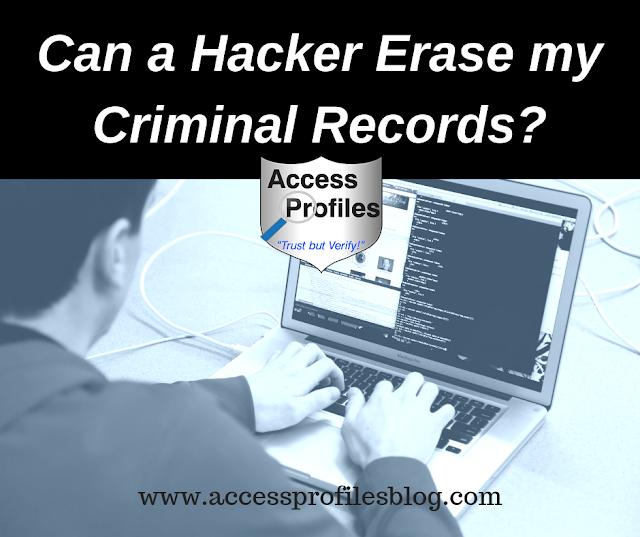 “If by your question you mean could someone “hack” into an online database and completely erase your criminal record, the answer is NO. While it may be possible for the hacker to breach a particular site, criminal records are housed on many sites, both virtual and physical. There are many online databases that hold criminal records. Some are tied directly to the local and state courts where the offense occurred. Other sites are run by companies who collect criminal records for public access. There are many of these types of databases and it would be extremely difficult, if not impossible, to get into each one and erase records. Then there are the physical sites to deal with. Courts hold their own “paper” records of court cases within their jurisdiction. These records would be extremely difficult to “erase”. The more important question, however, is why you want your criminal records erased and what you hope to gain from it. If it is because having a criminal history is keeping you from achieving a goal ~ getting a job or buying/renting a home ~ I understand. If that is the case, there are better ways to go about it! If possible, you can pursue an expungement of your record(s). However, this will cost money and there are definite restrictions on the kind of records that are even eligible. Instead, you are better off to be prepared to deal with your criminal history. 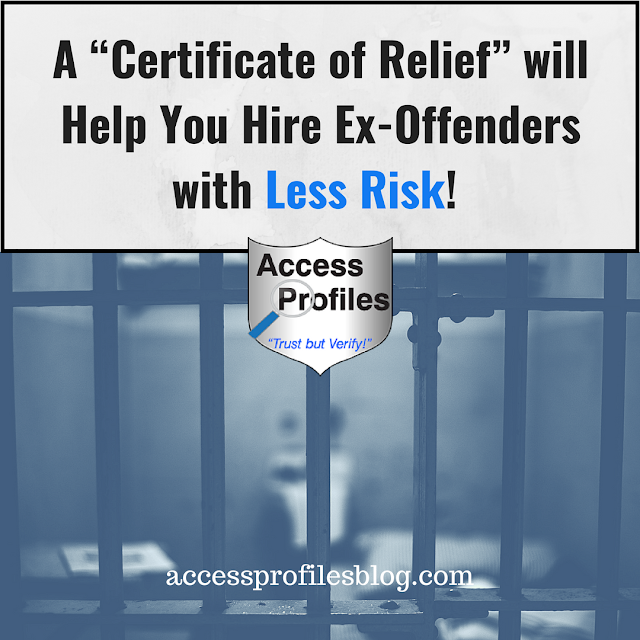 First, if possible, look for employers in your area that are open to hiring ex-offenders. If that is not an option, be ready to explain and mitigate your criminal past. Be upfront with potential employers. Be prepared to explain the circumstances surrounding your offense(s) and what you have done since then to change and better yourself. 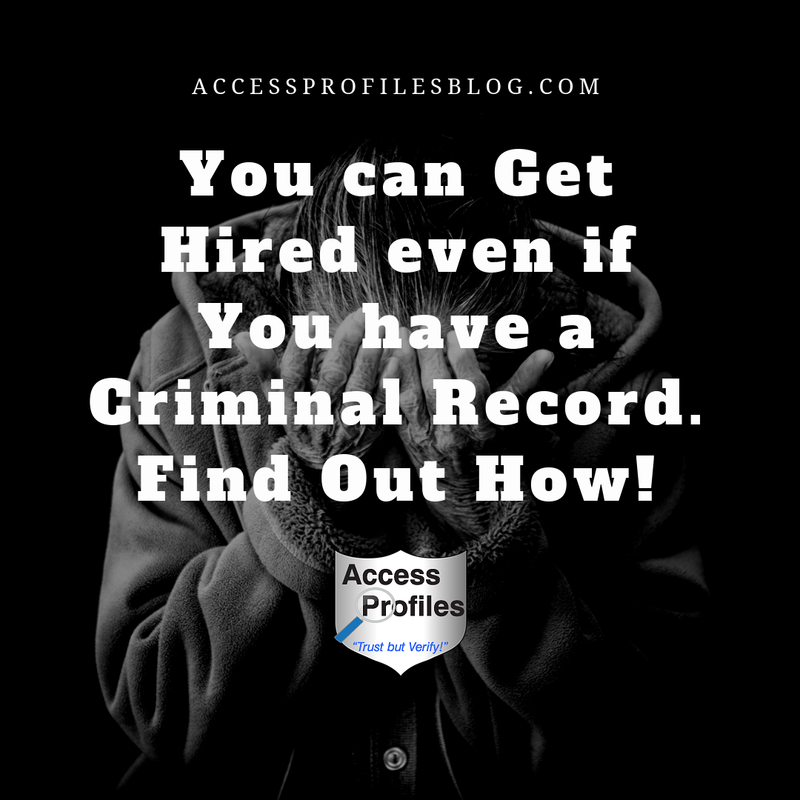 Find out more about what you can do to get hired even with a criminal record in; Job Seekers: Do You Have a Criminal Record? Find out the Best Time for You to Tell Your New Employer!”. You can find the original question and any other answers submitted here! While I think my answer was on the right track, after posting it I realized I had not gone far enough. It needs to be emphasized that “hacking” into any database is a criminal offense. Trying to take this action would simply add another charge to a person’s already problematic criminal history. So why try? It simply makes no sense. It is important to be smart instead. For many employers, finding out you lied can be a bigger deal breaker than discovering you having a criminal history. That is why being prepared and ready to take responsibility is crucial”. Find out more here! Following these steps will show your desire to change for the better. Committing another criminal offense by trying to “hack” into your criminal records would definitely do more harm than good. While it is clear I certainly believe in second chances, it is important to realize that there are employers out there who believe the same. These employers recognize that “people cannot only be defined by their pasts. Our greatest ability as human beings is being able to learn from our mistakes. We need to recognize this. We as employers and Background Check companies need to move past the notion that “Once a Criminal, Always a Criminal”. People can change. And giving them another chance can help make that change more permanent”, excerpt from “Once a Criminal, Always a Criminal ~ Why We need to Believe in Second Chances”. While trying to find a job when you have a criminal record is most definitely hard, it is not impossible. Ex-offenders may need to start small. Begin by taking any job you can get. Work hard and prove yourself. Then, when you are ready, try for a better job. You may still find employers who are not willing to take a chance on you, but keep going. It is important to persevere in order to get what you truly want ~ a productive and worthwhile future. We can help you in your Job Search and get your resume “background check ready” ! 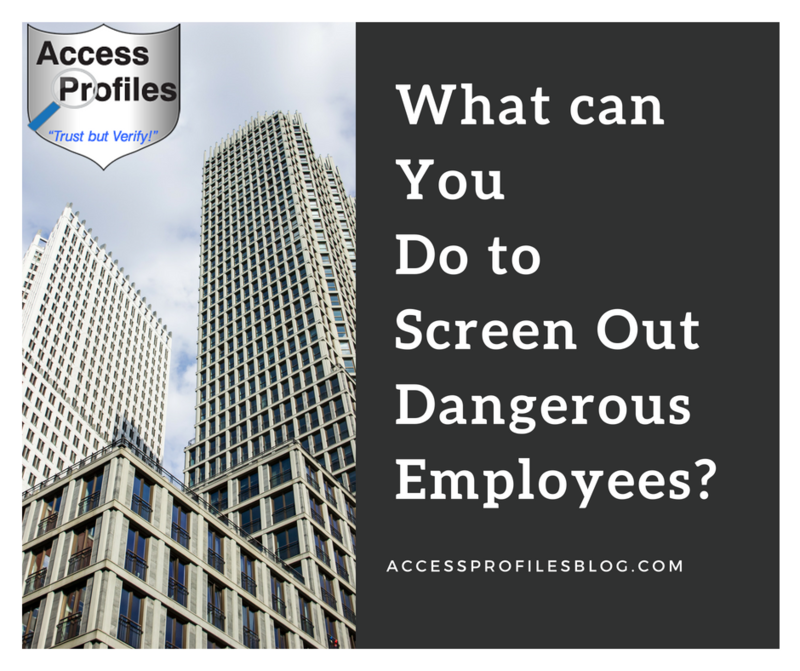 What can You Do to Screen Out Dangerous Employees? When it comes to hiring, employers are understandably cautious. Of course their first worry is whether or not their new hire will be able to do the job. But, it doesn’t end there. Many have become even more concerned that they may be bringing someone into the company who could possibly cause harm to their other employees, their customers, and even to their company. That is why they want to do whatever they can beforehand to at least lessen the possibility of bringing in a potentially dangerous hire! “What evaluations are the best to screen out employees capable of aggressive or violent acts?”. "The safety of your employees, your customers, and your company itself should be a priority for any business. The first step in achieving this is by consistently using thorough pre-employment background checks. This screening needs to include a search for criminal records in anyplace where your applicant has lived and/or worked within the last 7 -10 years. It should also include past employment verification and reference checks. Some may think checking references is a waste of time, after all, anyone listed by the applicant is bound to say only good things about them, right? While that is a legitimate concern, in reality, references can be unpredictable and, if asked the right questions, may reveal more than intended. In addition, a good background check company will recommend that “developed” references are also checked. Developed references are ones that are identified through the listed references. Doing these checks helps an employer get a good overall picture of their applicant. However, it can’t stop there. If you decide to make the hire, there are also things you can do after that to help protect your other employees, customers, and company. Workplace observation is key. Establishing sound procedures within your company for reporting unsafe or worrisome behavior is a start. Then it is important to follow that up with direct supervisory observation and discussions with the identified employee. Find out how you can create and implement good employee safety practices in Workplace Safety Needs to be a Team Effort! Another step you should take is to periodically re-screen your existing employees. Establish a protocol and stick to it. You may decide to re-screen on a rotating time-frame, or only when considering someone for promotion or there is cause. This cause can stem from workplace observations or concerns. Learn more about How and When to Re-Screen your employees in Re-Screening Existing Employees? The Pros and Cons for Your Small Business. Whatever steps you take to protect your company, it is vital that you are consistent. Don’t pick and choose who you screen. 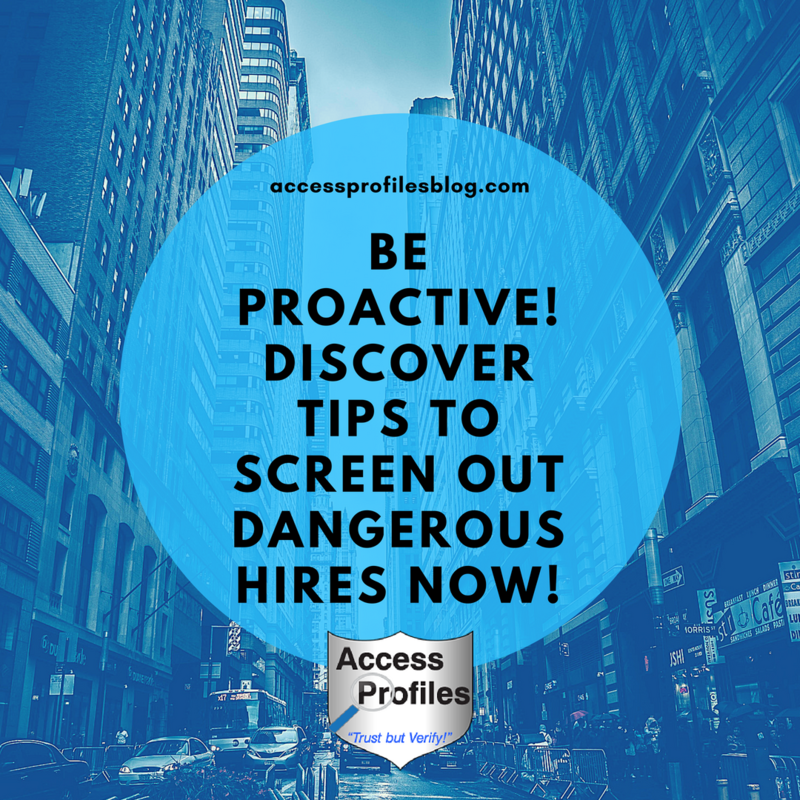 Make it a practice to do background checks on all new hire and consider re-screening existing employees as needed. You can see the original question and other responses here!". Be Proactive! Discover Tips to Screen Out Dangerous Hires Now! "Tweet This"
However, despite your best efforts, it is still possible that a dangerous situation can happen in your workplace. This threat may come from an employee or even a visitor or intruder in your company. That is why, if you haven’t done so, you should develop a Workplace Vulnerability Assessment. The goal of a Workplace Vulnerability Assessment is to establish policies and procedures for your employees to follow in the event of a hostile or dangerous situation. You will need to address everything from the physical security of your employees to safeguarding your systems, controls, and company assets. The most important goal of this assessment is to create a plan so every employee knows exactly what they need to do and how to react if something happens. You will need to identify the best route for every employee to take to get out of your building and, if that is not possible, safe places to hide. You will even need to identify tasks that key employees should initiate if law enforcement or medical help needs to be contacted. Then, after developing your strategy, it is vital to practice your planned procedures long before there is an actual threat. Through this you can identify and correct any weaknesses in your strategy and make sure your employees are well trained. The employee training should include both table top exercises and actual drills. Are you ready for your company to develop their own safety strategy? We can provide you with a Comprehensive Vulnerability Assessment or guide you in conducting table top exercises and drills to identify areas for improvement ~ all tailored to your company’s specific needs. While no one can ever predict the future, doing what you can in advance to keep your workplace as safe as possible makes sense. Not only does it protect your company and your employees, it establishes you as an employer who truly cares about the safety and security of the people they hire. And that is a place where people will want to work! To find out more about other ways you can protect your company, visit our Background Investigation and Security Consulting services pages. You can also find out more About Us and What Our Happy Clients have to say!